Unlike books that encourage rote memorization, the conversationally-written EKG Plain and Simple puts the student at the patient’s bedside. This popular text focuses not just on identifying rhythms or EKGs, but also on what can be done for the patient. Assuming no prior knowledge, the text covers basic to advanced EKG concepts. Part I progresses seamlessly from basic cardiac A&P through waves and complexes, lead morphology, and rhythms. Part II covers 12-lead interpretation, axis, hypertrophy, myocardial infarction, and more. The author provides many clinical scenarios, anecdotes, and critical-thinking exercises, plus over 500 practice rhythm strips and 12-lead EKGs. The Fourth Edition has been updated to include improved opening scenarios, streamlined explanations, new tables, and more photos, art, and visual aids. 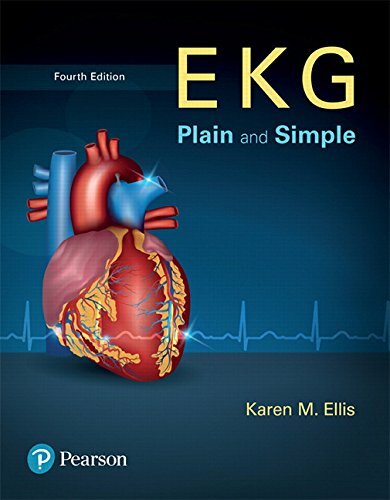 Now available packaged with the Fourth Edition of EKG Plain and Simple , MyHealthProfessionsLab is an online homework, tutorial, and assessment program designed to work with this text to engage students and improve results. No matter their learning style, students will gain a solid foundation in EKG interpretation through pre-built homework assignments, interactive case studies with assessments, animations, videos, and more! Practice CCT and CET exams provide a true-to-life experience that prepares students for their certification exams. Within MyHealthProfessionsLab’s structured environment, students gain knowledge that will carry through to their professional careers.